You can return your undamaged product and packaging within 30 days for any reason. And offering 24-month guarantee for quality-related issues. – The dust guard wrapped the part of massager contacted with body. It can be removed for cleaning. 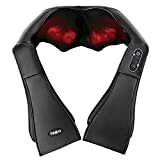 – The pocket handle allows you to apply pressure and adjust the massager to target hard to reach areas. – UL certification approved wall adapter and car adapter are included.